Put us to the test...at your site. 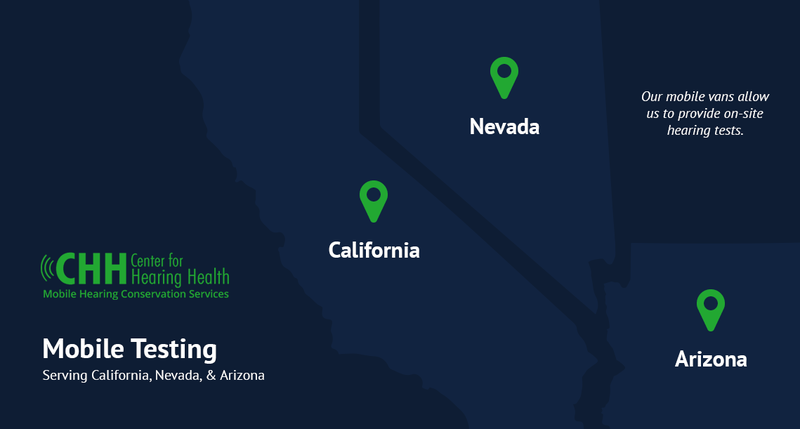 CHH directly serves businesses throughout California, Nevada & Arizona providing the convenience of on-site health testing & OSHA compliance services. All vehicles are aesthetically pleasing and designed to provide a professional and valued experience. The mobile service is routed to accommodate a company’s production schedule and the work shift time period(s). The procedure is efficiently streamlined to minimize costly off-the-job time without compromising either the quality of the test or the importance of personal attention. CHH is nationally recognized as a reliable resource for referrals to providers outside of our service area. We partner with safety administrators to educate and motivate employers and employees to support and incorporate hearing conservation practices that effectively prevent noise-induced hearing loss. Copyright © 2019 Center for Hearing Health. All rights reserved. Web Design by Digital Attic.